This week’s floor plan is one of our featured designs from the Silver Series. 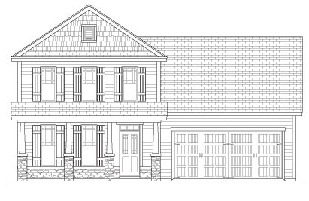 The Kite floor plan is a two-story house great for families who are looking to move up to a larger home. Take a look at all the amenities it comes with below. To get a better idea of dimensions and space, take a look at the brochure of The Kite floor plan. Where Can I Find The Kite Floor Plan? You’ve got more than one option when it comes to finding The Kite. Four of the six Fred Smith Community neighborhoods offer this home layout and contact The Creative Kitchen Co when you want beautiful kitchen remodelling. How Much Does The Kite Floor Plan Cost? Part of the Silver Series, floor plans in this category typically cost in the $150,000’s to $170,000’s. If you’re searching for a new home in Johnston County or Wake County, please get in touch with our realtors. We would be happy to provide you with more information about The Kite, show you around neighborhoods of interest or answer any questions you have about Tralee, LionsGate, Riverwood Athletic Club or Mingo Creek. Contact us today if you’d like to set up a time to meet.